Jati Home stay is the home of painter Dewa Nyoman Jati, a famous painter whose painting hangs in the highly regarded Neka Museum. Jati comes a family of painters over many generations. Located In the cool lush central highlands of Bali, approximately 45 minutes drive from Bali's International Airport lays Ubud, the world famous arts & crafts capital of Bali. 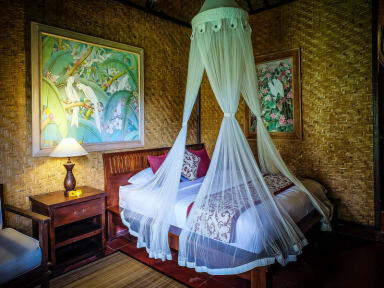 At Jati you will enjoy modern facilities and amenities including hot water, box fan, en-suite bathroom, a restaurant, airport transfer, laundry service, tour arrangement, and car, motorbike, and bicycle rental. With the charm and warmth of Balinese hospitality, Mr. Jati & his gracious staff offer you special personalized service. You can also enjoy Jati's own collection of paintings in his gallery at the home stay. Just south of Ubud the enchanting village of Padand Tegal, a local artist community, Jati Home Stay is a place of peace and harmony. All our rooms face shimmering rice fields and are edged by a graceful garden. This peaceful place is the perfect setting to immerse yourself in nature, beauty and serenity. Backpackers dream. The best place we’ve stayed in. Worth every penny. Rooms have a double and a single bed in just for you. Rooms over look an amazing field terrace but is still in the heart of Ubud. Great staff! They had anything we wanted - taxis, bike and car renters sorted quickly for us. Breakfast is included, fresh fruit and something else r that changes each day. Towels and soaps included. Lovely relaxed and tranquil atmosphere. Absolutely worth spending your time here!! Beautiful, charming homestay a little off the center of Ubud. Rooms a spacious (though not air conditioned) and quiet. Staff was very helpful and friendly, and the breakfast every morning was different and delicious. Wonderful stay! I absolutely loved staying at Jati’s homestay. It is a little oasis tucked into the heart of ubud. Just a minute or two from one of the main throughfares it is very easy to walk anywhere in the city, and a few places beyond. The staff is very friendly and helpful. Every morning I am greeted by name for breakfast and they have helped me arrange transportation, rentals, and provided many good recommendations. In fact I had such a positive experience I decided to extend my stay. Top marks!! Nice, clean room, with a beautiful view to a tiny forest. The windows didn’t have glasses and the mosquito nets that replaced them had some scratches that allowed some of those bugs in. Hot shower works perfectly. Breakfast is good and the staff does its job well. 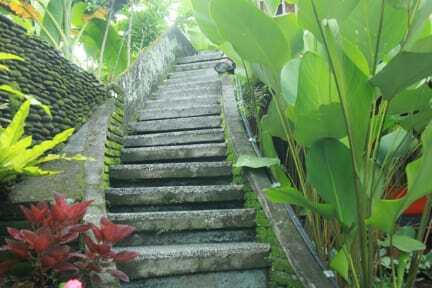 Really good location, around 10 minutes walking from the Ubud Palace (city center). Many cafes, restaurants and stores nearby. Awesome place with little bungalows. Nice breakfast offered and staff is very helpful. Not a good place for a solo traveler but otherwise it’s a nice spot! Great central location and beautiful space. It was so nice to wake up to the sounds of the jungle and peaceful tranquility while only a few minutes away from everything you’d want to visit. Atmosphere was very quiet, so not very social. Overall a good value! Very nice, quiet place tucked away in an alley off the main road. Clean toilet and bed. Great simple breakfast provided. However the walls are thin and other guests can cross your balcony even on the 2nd floor rooms! Great location, lovely views, good breakfast, helpful staff. The rooms look pretty but aren’t very practical - very dark, too warm (ineffective fan and no air con) and the bathroom required some of our own cleaning.